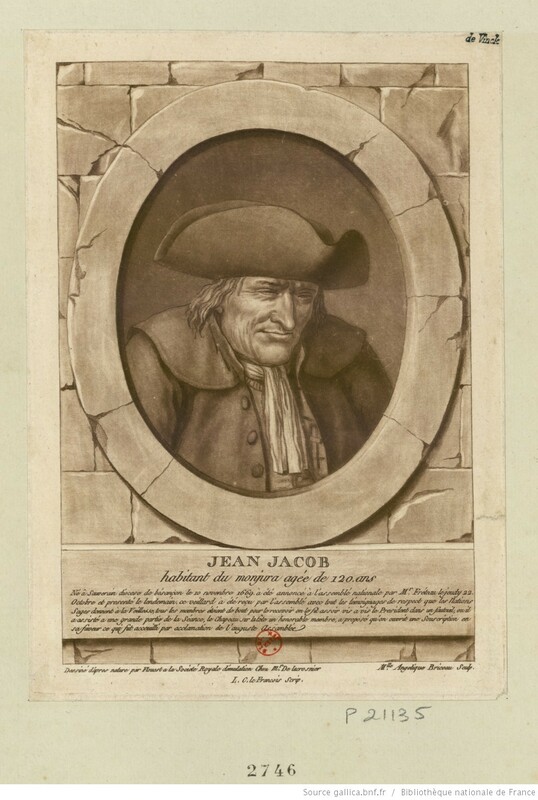 Rodama: a blog of 18th century & Revolutionary French trivia: Jean Jacob, "doyen de France"
This little picture, which was auctioned by Pierre Bergé in June 2013, represents Jean Jacob, the "Centenarian of the Jura", who in 1789 at 119 years old was believed to be the oldest man in France. In October 1789 the sudden appearance of this ancient peasant in the National Assembly caused a minor sensation and catapulted the old man briefly to celebrity status. The picture had been in the possession of the Jacob family since the 18th century. Jean Jacob first became known beyond the confines of his village in 1785 when his daughter Pierrette made a request for his financial support which was forwarded by the Intendant of Besançon to the Controller-General of Finance. An accompanying certified copy of his baptismal record confirmed that Jean Jacob was then 115 years 10 months old. According to some accounts, his advanced age piqued the generosity of the Princess Élisabeth. He was granted a pension of 200 livres, to which the King added an extraordinary gratification of 1,200 livres. The lawer Renaud who went to announce the news to the old man, found him "in perfect health, with a good memory and sound appetite, having a happy disposition and no wrinkles on his forehead, although a bit deaf and blind..." Jacob was delighted and drank the King's health. The local curé was charged with receiving the pensions and guarding against the depredations of the old man's daughter. In February 1786 and again in January 1788, certificates were issued confirming the old man's age and affirming that he was still in good health. The existence of this ancient soon piqued more general interest in Paris. 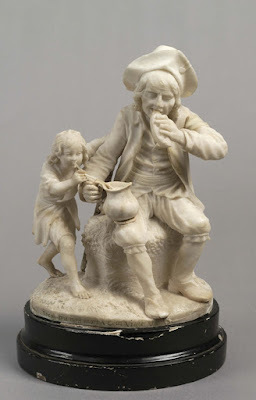 In October 1788 a description of the old man appeared in the Journal de Paris written by Joseph-Antoine Cerutti, a former Jesuit and popular journalist of some repute. Cerutti's romanticised account of his meeting anticipates much later speculation about the causes of longevity and the virtues of rural simplicity. Reading between the lines, however, Cerutti found the old boy disappointingly unresponsive, if not positively senile. In 1789; somebody supposed it would be appropriate - and presumably profitable - for Jean Jacob to make the journey to Paris. Remarkably he survived the 300-odd mile trip, nursed by Pierrette and three cousins or neighbours, one of whom, Joseph Thevenin, was a doctor. The three men funded the venture. On his arrival, at the beginning of October. he was said to have stayed in the same inn as on his first trip to Paris, over a hundred years ago. Workshop of Joseph Rosset, "Jacob du Iura mort a Cent Vinte An AD"
Musée Antoine Lécuyer, Saint-Quentin, c. 1790. Marble. 28 cm. On October 11 he was taken to the Tuileries to be presented to the King; When Louis asked the secret of his longevity Jean Jacob obliging cited his diet of ?maize potage ("les gaudes"). A fine portrait by Jean-François Garneray (now in the Musée Lambinet) was painted soon afterwards. It was later presented to the National Assembly and a print sold for the profit of the old man. "They announced an old man of 120 years, born in the Jura mountains. He wished to see the Assembly which had freed his homeland from the bonds of servitude". 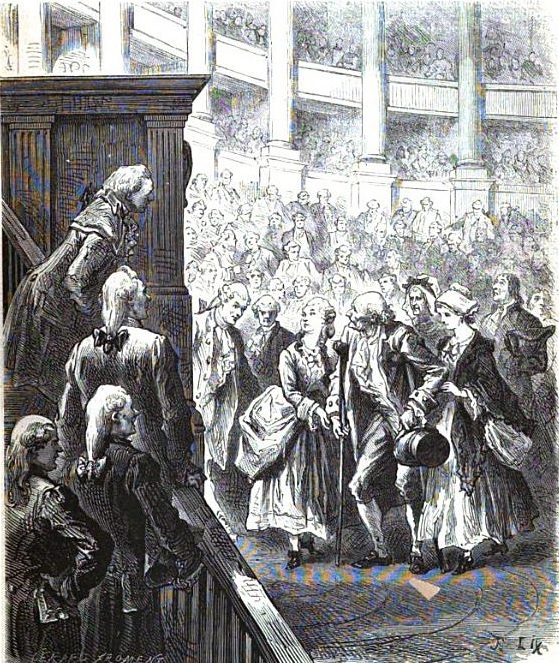 The abbé Grégoire declared that the Assembly should show its respect by rising to its feet when this astonishing old man entered, a proposal which was greeted with transports of emotion. He walked in on crutches, led and supported by his family, clutching his baptismal record. The Assembly duly stood. He was seated opposite the President, replaced his hat on on his head and sat through the session. It is tempting to imagine that the deputies were somewhat taken aback by the spectacle of this almost moribund ancient, quite unlike the sturdy survivor portrayed by the press. They were rescued by the deputy Nairac who remarked that the visitor's great age had enabled him to witness the regeneration of France and proposed that a collection should be made for his family. The President then announced a request from the deputy Bourdon de la Crosnière, "the author of a plan for national education" that the old man should be accommodated in his patriotic school to enable pupils to learn respect for the elderly. Mirabeau retorted swiftly "Do as you will with the old man, but see that he remains free". 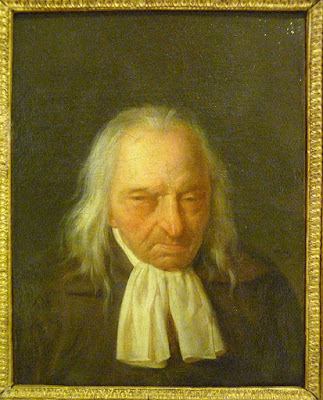 It seems unlikely that Bourdon had appreciated the decrepitude of the old man; nonetheless he kept him in his charge long enough for the artist J-M. Flouest to complete another portrait "at the window of the hôtel belonging to Société d'Emulation de M. de Lacrosniere" Retrieved by his family, Jacob was reestablished in lodgings in the rue Marivaux, where he could be seen by the curious, presumably for some appropriate donation. It rapidly proved too much for Jacob, who died on 29th January 1790. He was buried with some ceremony in the church of St. Eustache. It is usually added that Pierrette returned to Montfleur where she died in 1828 at the age of "only" ninety-five. Writings about Jean Jacob reveal both Enlightenment curiosity about longevity and a fashionable sentimental esteem for his simple life of honest labour; according to Jean-Pierre Bois, historian of the "myth of Methuselah", the Revolutionaries venerated old people in the same way as they did the young and the married, as the natural building blocks of a regenerated society. Their attitude nonetheless represented a departure from earlier more fanciful speculation about advanced old age - Jean Jacob was simply a very old man. The local authorities in Montfleur have recently named a "rue Jean Jacob" in honour of their famous centenarian; this writer is unimpressed; he would have prefer a Napoleonic hero. During the trip that I have just made to Franche-Comté, they told me of an old man who was 119 years old.....MM. the curés of Montargis and Saint-Julien took me to the house where this patriarch lived... We founded him sitting on a stone bench outside the door of his house. He comes here every day to rest, or rather to revive himself in the sun. When we arrived he was asleep. His sleep was the easiest in the world, his breathing easy, his pulse regular and calm, the veins on his forehead were transparent blue and alive;. Snow-white hair fell to his collar and strayed onto his cheeks, which were the healthy colour of an infant's. They woke him up to make him speak. He then seemed to me less lively and attractive. He was deaf and his eyesight was feeble; but he had lost his sight and hearing only three years ago. At 115 years old, no-one would have supposed him more than 80. At 110 he was still one of the most tireless workers in the countryside, even leading the band of haymakers in the haymaking season. At table he distinguished himself with his hearty appetite and his singing, with a voice which astonishingly full and melodic. At about this age he conceived a desire to see the village of Clervaux where he was born and he travelled there on foot. When he arrived the inhabitants were in dispute with their seigneur about the position of a cross which marked the boundary between their lands and his. The old man....went to examine the cross .... and recognised that it was not in the same place as the border of former times. He took the inhabitants to a pile of stones a league away and, when the stones were removed, they discovered the old boundary cross; which put an end to the whole affair. In his first youth, he had been in the service of M. de ***, one of the greatest nobles of the province, who still exercised the full tyranny of the feudal regime. He recounted that one of the pleasures of his illustrious master was to shoot the masons who were working to finish his chateau. In true seigneurial fashion, he called this pastime "hunting the peasants" (les vilains) The old man added, it is true, that after assassinating the masons, he had them buried with ceremony and undertook the upkeep of their families. He killed of his free will, but he paid for it. Informed of the existence of Jean Jacob (this was the name of our centenarian), the minister M. de Maurepas, took an interest in him and obtained for him a royal pension of a hundred francs. It is impossible to convey the emotion shown by the old man at the very mention of the King. If I was a few years younger, he said to me, I would go to Versailles to thank him; I cannot but my thanks can be addressed to the sky which is the neighbour and friend to all." "Histoire du centenaire Jean Jacob décédé à Paris le 29 janvier 1789" Le Conservateur de la Santé Vol.5 (1807). [ This account was said to be based on the testimony of Joseph Thevenin, the surgeon who had accompanied Jacob to Paris in 1789]. ... Jacob was among the strongest and most resourceful of his class, as well as being very hard-working; he had a reputation as the most active and intelligent of workers. His occupations, over the course of his life, were successively, domestic servant, farmer worker, day labourer, woodman and shepherd. He kept his strength until the age of 106 when a mule kicked him and broke his leg. This accident deprived him of the capacity to work, but without removing his long custom of exercise; he still walked around with the aid of crutches. He liked the fresh air and, despite his infirmity, could commonly be found stretched out on the bare earth asleep, exposed to the full force of the burning sun. All his life he retired to bed early and rose early; this habit never left him even in extreme old age. ....He was blessed with a strong physique, a easy walk and firm carriage. He was five feet six, with well-formed limbs and pronounced muscles which proclaimed his strength. A fine head, only lightly wrinkled even in extreme old age, surmounted wide shoulders and an ample chest. He worshipped cleanliness; he washed his hands and face in cold water whatever the weather, and often his feet as well. He took good care of his hair which still covered most his head at the time of his death and was still only grey. He shave regularly with cold water. Jean Jacob was married three times. With his first wife he had four children; three died in infancy, the fourth married and died at sixty-nine....His second wife gave him two children; one died in adolescence and the other on the battlefield. Finally he had three children by his third wife, two daughters and a son. Two are still alive; the daughter is married and aged about fifty-five (?maybe in 1789) The son was in Paris in 1789, having come from Nantes especially to see his father. He was then thirty-six...meaning that he had been born when his father was eighty-five years old. The reputation of the centenarian Jacob came to the attention of the King....People came from all around to visit the old man out of curiosity. He always conserved his rounded stomach and happy face, his good memory and his gaiety. If there was to be a visit, Jacob brought out a few glasses of wine, sang a song and told his listeners an fifty-year old story. They increased his pleasure with gifts of money, wine and tobacco which he always kept for himself. Although reduced to a state of vegetation, he vegetated with pleasure and kept to the end of his life three passions - vanity, anger and love of money. Jean Jacob only survived three months after all these deonstrations of curiosity, respect and interest; he died on the 29th January 1790, at No 7 rue de Marivaux, having received the consolations of religion from M. Poupard, the cure of St Eustache. The old man suffered no agonies, but died quietly like a light going out. He was clean to the last and never soiled his bed. His pulse remained strong. When he left this world, Jacob was aged one-hundred and twenty years, two months and twenty days.